Water Ring pump used for vacuum Rotary Drum filter- Vacuum Pump - EVP Vacuum Solution! In each rotation of the drum, it through four functional zones. 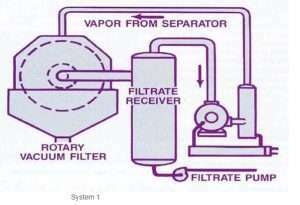 Such as the filter cake forming zone, sucking dry zone, back blowing zone and the rest zone. The resting zone mainly function is buffer between positive pressure and negative pressure when it’s conversion. Drum vacuum filter are going vacuum filtration in 400 ~ 600111m Hg generally. The drum’s rotary speed is 0.3m / min or below generally. Vacuum filter power consumption is about 1000W /m2. Drum vacuum filter’s max filter area can up to 200 square meters. Drum speed can adjust the thickness of the filter residue. 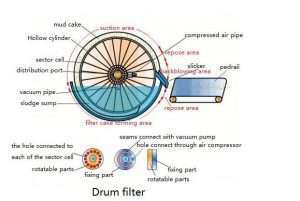 Most of the drum speed is 0.1 to 10 minutes per cycle. 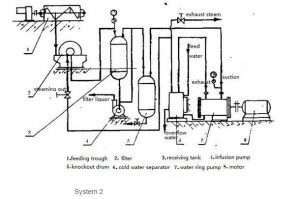 The absolute pressure of the operating vacuum is (0.25 ~ 0.8) × 10 Pa. The temperature of the filtered suspension should be lower than the vaporization temperature of the filtrate at operating vacuum. This filter capacity is very large and it’s easy to operate. The residue can be washed. 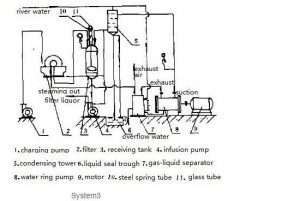 It usually be used to filter the higher concentration of solid particles suspension. It also can to clarify the thin suspension filtration when drum vacuum filter with pre-filter layer. Typical Applications: Decolouration of glucose syrup. Enzyme preparation filtered. Juice filtration. Antibiotic fermentation broth filtration. Commonly Applications: food, medicine, organic chemistry, wastewater treatment, oil and other industrial sectors. Main features: host scraper system inverter control, automatic feed and discharge. Host and material contact part of the material is 304 or 316L. The host drive system for the two gear slowdown, and by the AC inverter stepless speed control. The drum pre-filter aid (diatomaceous earth, perlite, activated carbon) thickness generally above 80mm. Host continuous operation, stable operation, easy maintenance. This machine has the separation of solid phase concentration is very low, very fine particle size, easy plugging cloth suspension capacity.